Luke Pergande made two of the 13 futures wagers that were placed on the Golden Knights at 500-1 odds in October at the Westgate sports book. He made a $50 bet for himself that will pay $25,000 if Vegas wins the Stanley Cup and also placed a $20 wager for his then-girlfriend, Jami DeLauri, that will pay $10,000. They’ve since broken off their long-distance relationship, but Pergande still gave the ticket to DeLauri, who lives in Boston. “This is the character that I possess,” Pergande quipped. DeLauri, an avid hockey fan who remains friends with Pergande, said the wager was her idea in the first place. He said it was a joint effort. “We’ve argued about that a little bit. But it was my idea all day,” she said. “Just because the odds were so crazy, I thought why not put $20 on it. You never know, and (Marc-Andre) Fleury’s an All-Star. A co-founder of PropSwap, a secondary market for active sports bets in Las Vegas, Pergande sold his ticket for $550 in November to a business associate who is letting it ride. He insists he has no regrets. DeLauri has no plans to sell her ticket. And not just because she doesn’t want to pay her ex-boyfriend a 10 percent commission. “They have home ice, and I truly think they can pull it off,” said DeLauri, who hopes the Golden Knights give her a birthday present Monday in the form of a victory in Game 1 of the Stanley Cup Final against the Washington Capitals at T-Mobile Arena. Las Vegas resident Hermin Soriano and his wife, Charrize Dy-Soriano, rolled over some of the profits from a football parlay and teaser they hit on back-to-back days in October into $400 on the Knights at 100-1 odds to make $40,000. They placed a $300 wager at the South Point sports book and made another $100 bet on its mobile app. When Soriano, a food server at The Cosmopolitan of Las Vegas, showed his co-workers the wagers, he was ridiculed. But Soriano and his wife had the last laugh. They sold their $300 ticket Monday for $12,600 on PropSwap and plan to use the money to pay for a trip to Paris this summer. They’re letting the $100 ticket ride. “Thank you, Golden Knights!” Soriano said. “We already turned $400 into $11,500, so we’re just going to roll with the $10,000. 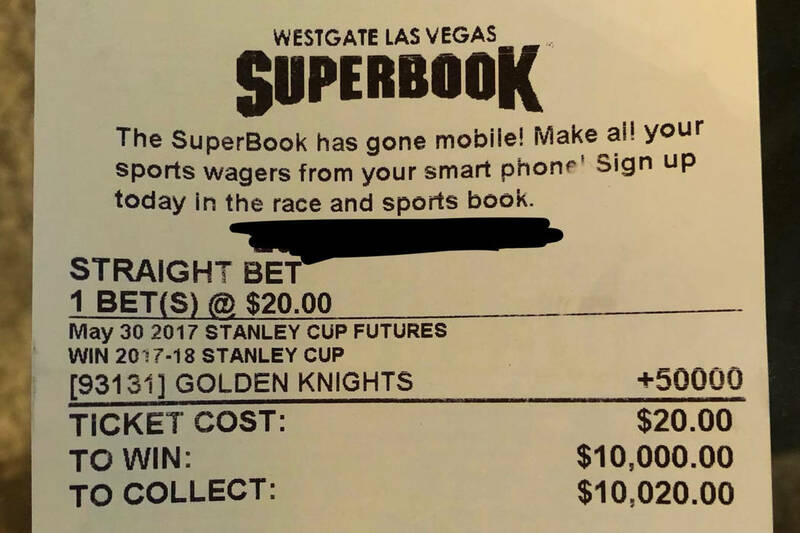 The day after the Knights beat the Arizona Coyotes 5-2 in their home opener to improve to 3-0, UNLV student John Lytle placed a $100 futures wager on them at 200-1 odds at Texas Station that pays $20,000. A full-time student who was born and raised in Las Vegas, Lytle said he has won money betting on the Knights all season and doesn’t plan to hedge a cent. “I’m not going to take $10,000 and walk away when I know I’m going to have the whole $20,000,” he said. “If I’m going down, I’m going down with the city. It’s not about the money. I’m ready to make history with the city. We’re going to do it. If the Knights win, Lytle said he plans to use his winnings to help pay for law school. Recent San Diego State graduate Joe Ellis also placed a $100 futures wager on the Knights after their home opener, albeit at 150-1 odds at Red Rock Resort. He split the ticket with his two college roommates, with his $60 paying $9,000 if Vegas hoists the Cup. Ellis, who lives in San Diego, considered selling the ticket to help pay for a backpacking trip across Europe this summer. But now he’s planning to let it ride. If the Knights do end up lifting Lord Stanley’s Cup, Ellis will just have to remind his father, who lives near Red Rock and has the ticket, that he didn’t actually make the bet.